BEREA, Ohio (AP) — As John Dorsey prepares to make a critical decision he knows may shape Cleveland’s football fortunes, the Browns general manager spends a moment every day giving himself a pep talk. Dorsey is in the early stages of heading his first coaching search with the Browns, who have been in a futile pursuit of a competent leader for nearly as long as they’ve been looking for a quarterback. With the Browns (3-6-1) on their bye this week, Dorsey provided some insight into a quest that will accelerate once the season is completed and conclude with Cleveland’s ninth coach since 1999. 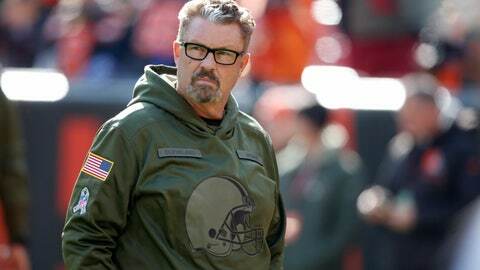 As expected, Dorsey said interim coach Gregg Williams will be one of the candidates interviewed. Dorsey has been impressed with the job that Williams, the team’s fiery defensive coordinator, has done over the past two weeks since taking over for Hue Jackson, who was fired on Oct. 29 after going just 3-36-1 in two-plus seasons. The Browns beat Atlanta 28-16 on Sunday and have split their two games under the 60-year-old Williams, who Dorsey feels he has provided more than stability. Williams has previous head coaching experience with Buffalo from 2001-2003. He was also the defensive coordinator in New Orleans from 2009-2011, when he guided a group that won the Super Bowl but was also embroiled in the “Bountygate” scandal that resulted in him being suspended by the NFL for one season. Dorsey would not divulge who else in upper Cleveland’s management team will help him find a coach, but he was adamant the Browns will not hire an outside firm to assist, which is something owners Dee and Jimmy Haslam have done in the past. “We don’t need that,” he snapped. Dorsey was tight-lipped on other aspects of the search, including whether he would be willing to hire a college coach with no pro experience. However, he did outline the traits he’s seeking in a new coach. Dorsey promised to be as publicly quiet about the search as he was earlier this year when he kept Cleveland’s No. 1 draft pick a well-guarded secret before choosing quarterback Baker Mayfield. That selection is part of why Dorsey feels Cleveland’s coaching gig is so appealing. Mayfield is showing signs of growth and along with rookie running back Nick Chubb, defensive end Myles Garrett, wide receiver Jarvis Landry and others, the Browns have a talented core of young players. The Browns also have nearly $60 million in salary cap space, a rabid fan base, 11 draft picks in 2019 and committed owners fixated on winning.